Identification: This is a tiny, oval species with a featureless notum and no obvious shell. The posterior margin conceals a small folded gill on the right side and a small plate-like shell on the left side. It has a reddish background color with both minute brown flecks and larger cream flecks on its notum. Natural history: Runcina sp. #2 is a moderately common species. It may be found occasionally in shallow, moderately protected rocky habitats at depths of 7 m (23 ft) or less. (Note 1) However, it appears to occur primarily in Halimeda kanaloana beds at depths of 13 to 29 m (43 to 95 ft). Taxonomic notes: This species was formerly lumped with Runcina sp. #1. However, the consistent association of reddish color and cream flecks plus it's different habitat suggest that the two forms are likely to prove distinct species with future work (though, it remains possible that they could be "re-lumped"). It was probably first recorded in Hawaii from Airport Beach, Maui by PF on Oct. 22, 1994. Photo: CP: 2 mm: Airport Beach, Maui; July 19, 2005. 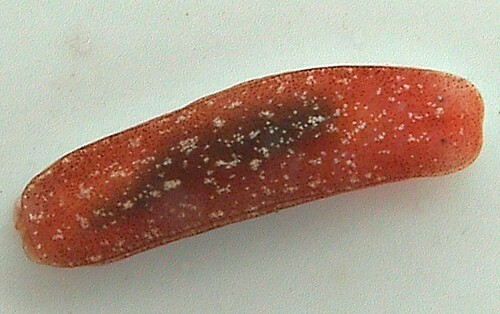 Note 1: All photographed specimens of Runcina sp. #1 and Runcina sp. #2 are unambiguously assignable to one or the other based on the background color and spotting. However, some of our notes regarding unphotographed animals found in the shallows at Hekili Point, Maui between 1991 and 1997 are ambiguous with regard to those characters. This may have been due to using different standards for the descriptions when we were still lumping them under one species or it may indicate that Runcina sp. #2 also occasionally occurs in shallow rocky habitats at depths of at little as 1 m (3 ft).